You just never know where you'll get inspiration! 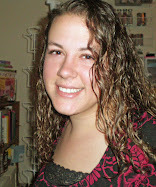 I was watching Trading Spaces this morning and one of the designers was working on a little girl's room. This particular team made some really cool flowers to hang from the ceiling and the following tutorial is my take on her idea. Cut all envelopes in half – at the 4¾ inch mark. Trim off excess of corner with paper snips. Run adhesive down the middle and across the bottom of each envelope, stacking one on top of another until all are adhered in a pile. 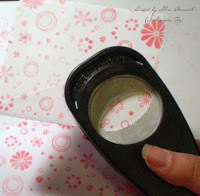 Run adhesive on the top envelope just as you did the previous nine. 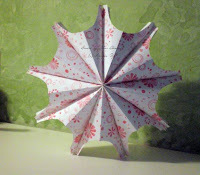 Attach the top envelope to the bottom envelope to make a complete flower. I would absolutely LOVE to see any examples you make with this! Email me at stampinmerr@email.com!! Thanks to some of my favorite local customers I managed to get rid of a bunch of my stamp sets and acessories. Here's a list of what I have remaining. I will have these with me at the Mega Crop on October 6, and they will be at a discounted price just for this event! I am so excited to announce that I will be participating in the New Covenant Academy's Girlfriends in Paris crop on October 8, 2007. I participated in their previous Mega Crop (their first one!) and had a BLAST. The energy and creativity at the crop was unbelievable! 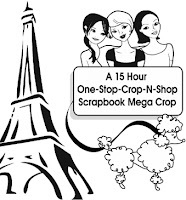 This time I will not only have a booth space and a make and take, but I will also be providing a basics stamping class called "Louvre to Stamp." 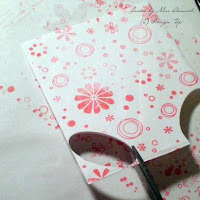 Need to learn the basics of stamping? Here's your opportunity! Learn basic stamping techniques such as masking, reverse masking, two step stamping, poppin' pastels, kissing, and rock and roll...to name a few! 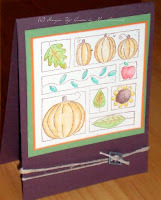 Includes project supplies for two cards, cheat sheet, and a Technique Booklet for all attendees. Isn't it exciting?! In addition to the booth and the class I will be offering door prizes and will be selling what's left of my retired stamp sets. This is also a great opportunity to hostess a workshop or order those stamps you've had your heart set on! Grrr... Every time we get a decent size rain my Internet goes out. Luckily though, this time my wonderful hubby (who is probably really tired of hearing me whine about the Internet being out!) came to the rescue and fixed the problem!! Yay Tim!! Not to worry though I do have a few cards I've been working on. I realize the two Snowflake Spot cards look very similar. There is a reason! 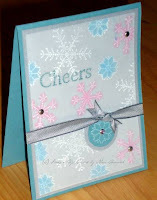 I was preparing for a workshop and fell in love with the Snowflake Spot card (at right) using the while Stazon ink on one side of the velum and colored pencils on the back. It gives it a frosty look I think. Unfortunately though the card was way too in depth for a workshop. So the second card is my simplified redo. 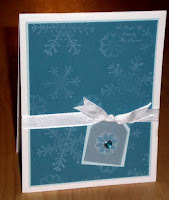 I still did the frosted velum but on the tag this time rather than the entire card front. In addition to these two cards I made a couple more using Festive Favorites. I'll go ahead and show you the one we made at our workshop. I used Always Artichoke, Bravo Burgundy and Brushed Gold card stock; Chocolate Chip ink, Watercolor pencils, blender pen, Hemp Twine, both tag punches and a couple pieces of Pewter Hodgepodge Hardware. After the workshop my friend Amy came over and I played around with the Thoroughly Thankful stamp set while she tried to convince me that the Wild Wasabi color "isn't that bad." LOL. I'm sorry to those who love it - I still don't like it! I did use it on my card however to prove to Amy that I can use supplies (or colors) that I don't like! 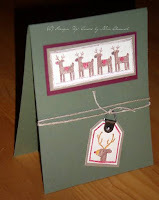 For this card I used Chocolate Chip, Wild Wasabi, Naturals Ivory and Pumpkin Pie card stock, Chocolate Chip ink, Watercolor Pencils, Blender Pen, Hemp Twine, and pewter Hodgepodge hardware. Don't you just ADORE fall?! I am so excited that it's that time of year! School is in session, the nights are getting cooler and the leaves will be turning soon! Keep an eye here on the blog for information about my upcoming fall events! !